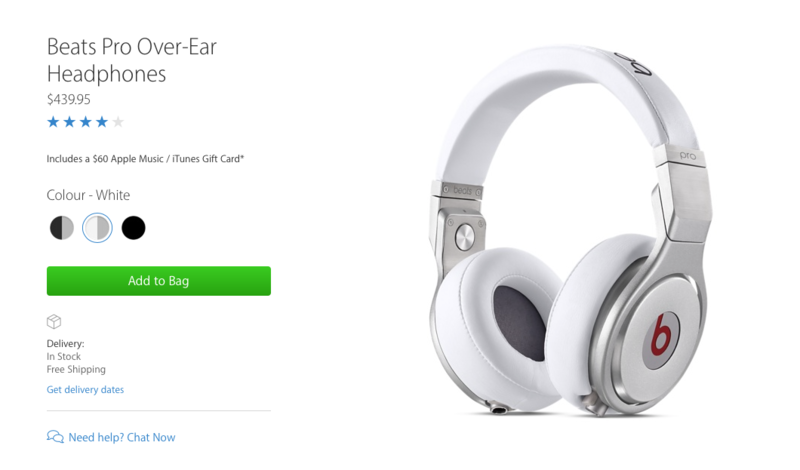 As spotted by 9to5Mac, Apple has launched a new promotion available both online and offline (in retail stores): Anyone who buys Beats headphones or speakers will get a $60 Apple Music/iTunes Gift Card. The promotion comes just in time for the holiday shopping season and runs between December 3 and December 28, 2015. Now it only remains for you to select the speakers or headphones you like, and there are a “few” to choose from: Starting from Beats Tour2 in-ear headphones and Beats by Dr. Dre Solo 2, up to Beats Pro Over-Ear headphones. All models are eligible for the $60 iTunes/Apple Music gift card. The price range for these headphones and speakers is from $139.95 to $439.95 (CAD). By the way, if you are interested in the cheapest Beats headphones, the urBeats in-ear model, you won’t get your $60 gift card, so you’ll actually pay the full price of $99.95. Will you jump on this deal?